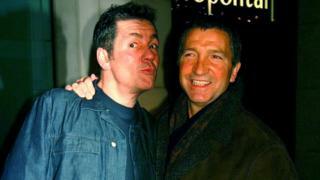 They say "opposites attract" in love, but the same can be said for friendship.Some were surprised to see that former hard-tackling footballer Graeme Souness went to the funeral of Supermarket Sweep host Dale Winton on Tuesday.In fact, the pair were good friends for many years, after meeting through Souness's wife. "We met in a restaurant in London and became great friends," the former Scotland captain told BBC 5 live last year. "We used to see him on holiday in southern Spain when we all went there. "Their friendship blossomed to such an extent that Winton asked Souness to be his best man. He proudly agreed, as all good friends would - unaware until the big day itself that it was just for a spoof wedding on BBC Three.Here are five other unlikely celebrity friendships. The long-standing Vogue editor - widely revered in the fashion world - is known for her icy, restrained demeanour. That is, it seems, unless she is speaking to tennis icon Roger Federer.Writing in Tennis magazine with rarely-seen warmth, Wintour opened up about their friendship, which began when they met for lunch through a mutual friend in 2005. She gushingly admitted that while "everyone calls themselves Roger Federer fans", she considers herself "a groupie". "It's no secret that he's appeared in Vogue about as often as Karlie Kloss," she continued.The Swiss ace has gone on to join her at numerous fashion shows, a world Wintour says he is "desperate to talk about".And when Federer accepted the her invitation to attend the Met Gala last year, Wintour said: "Roger was by far the best dressed. Nineteen Grand Slams, one Met Gala and counting." Game, set and costume match. As an actress, comedian and former senior correspondent on The Daily Show, Williams is no stranger to showbusiness - however the origin story of her friendship with Rowling resembles a fan's dream.Speaking on the Late Show With Stephen Colbert last year, Williams recounted how their relationship was sparked by a mix of Twitter and some liquid courage.After the Harry Potter author followed her on Twitter, Williams only decided to slide into her DMs in the midst of a night out. "My boyfriend [and I] were at a bar and we had been drinking and [he was like], 'You should DM her,' and I was like, 'no!' And so I did a shot and then I messaged her like, 'Heeey JoJo!'" "She was like, 'When's the next time you're gonna be in LondonThe pair, who share the same birthday like all good BFFs, went on to meet for "six hours of food and cocktails". Their relationship turned professional in March when Rowling cast Williams in the role of Professor Eulalie (Lally Hicks) in the forthcoming Fantastic Beasts sequel. 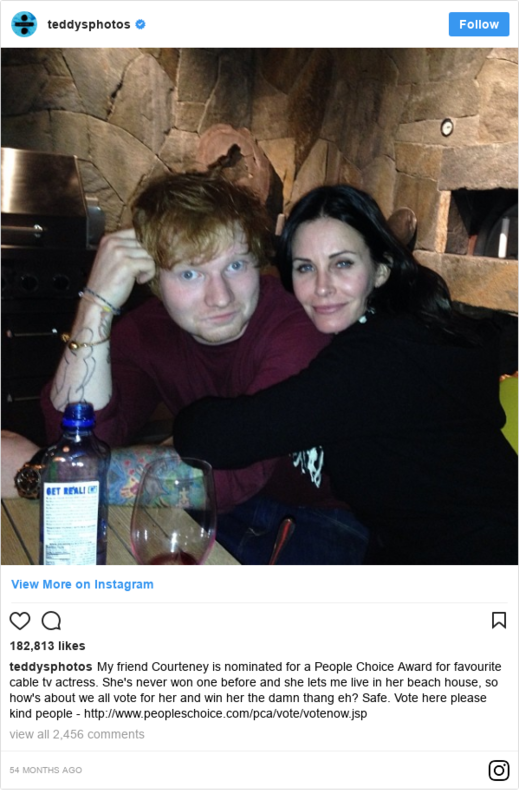 One is a contemporary pop star, the other is famed for playing Monica in the ever-popular '90s sitcom Friends.And yet despite their differences in space and time, the pair hit it off after being introduced by mutual friends.Sheeran even revealed he stayed at Cox's Malibu beach house while he was writing material for his album x, which was released in 2014. He told The Sun newspaper: "There was no rent but I made the bed and cups of tea and things like that. If you're staying at your friend's house, you should treat it like your own. "Well, actually, that's a lie - because I don't make my own bed at home. "Fast-forward to the present and it appears Sheeran has repaid his dues in another form - successfully playing matchmaker between Cox and Snow Patrol musician Johnny McDaid. This one dates back to the early noughties, when Eminem was criticised for apparently homophobic lyrics in his music.LGBT campaigners were angered by his use of derogatory terms to describe gay people on The Marshall Mathers LP.One person who came to the rapper's defence was Sir Elton.At the height of the controversy, the pair famously performed Stan together at the Grammy Awards in 2001, at the end of which they hugged and held hands. "For me, Eminem was never homophobic," Sir Elton said. "I listened to the whole of the Marshall Mathers album… and I was floored by it. And I thought, how could anyone think this is… he's just writing about the way things are. Not how he thinks, but the way things are. "Not only did they become firm friends, but Slim Shady even sent Sir Elton a rather bizarre wedding gift, as the Rocket Man singer recalled last year. Dyer, who plays Mick Carter in EastEnders, first met the legendary playwright in 1999 when the actor played a small role in Celebration at London's Almeida Theatre.Pinter, who received the Nobel Prize for Literature in 2005, subsequently asked him to appear in No Man's Land at the National Theatre.He later cast Dyer as Joey in his final play The Homecoming in 2008, months before the playwright's death from cancer.Speaking to The Guardian in 2013, Dyer - often living up to the image of an East End hardman - said he was "devastated" at the death. "He was the only person who I feared but loved," he said. "He was a tyrant... but he could get away with it because he was so enchanting. He was a poet."